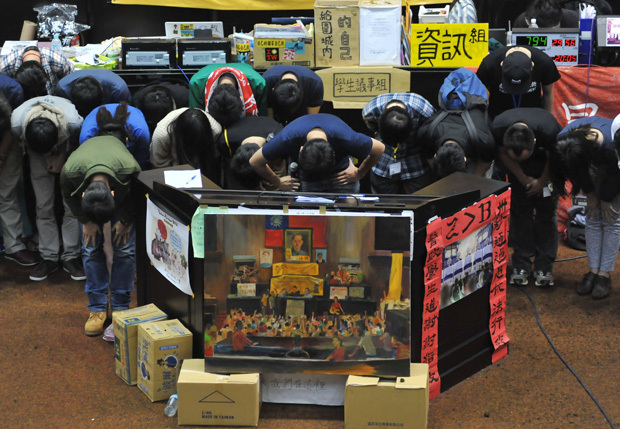 Students protesters bow during a protest against a contentious trade agreement with China inside the Parliament building in Taipei on Monday. Taiwanese protesters, who have occupied parliament for three weeks in protest of a services trade agreement with China, said they would leave on Thursday evening. But relinquishing control of the Parliament chambers is not likely to return sweetness and light to Taiwan’s politics. The Justice Minister avers that the law will not “turn a blind eye” to the ringleaders. They face up to seven years in jail, Taipei papers report. The organizers counter that, should President Ma renege on Speaker Wang’s pledge, “you won’t just see another 500,000 demonstrators. . .” Rear-guard demonstrators have already announced plans to camp-out in front of the Legislature indefinitely to ensure the government keeps its part of the bargain. The psychic transformation in Taiwan in just a few weeks has been stunning. At the beginning of March, Taiwan was in despair and resigned to a fate of eventual unification with China. At the end of February, Taiwan’s elites had been sobered by University of Chicago Professor John Mearsheimer’s pessimistic essay “Say Goodbye to Taiwan” that had received much press play on the island. The gist of it was: “China=big; Taiwan=small. America retreating; China advancing,” and Taiwan—like ancient Melos, wedged between Athens and Sparta during the Peloponnesian Wars of 2,400 years ago—should wave goodbye to its de facto independence, much less any hope of gaining it de jure. The Ma-Wang dichotomy is a paradox; the two men are leading figures of the Nationalist Party who hate each other with a white-hot passion—only last autumn, President Ma expelled Speaker Wang from the Party only to have the supreme judiciary rule it invalid. The rivalry is not a mere clash of personalities. Speaker Wang is now seventy-three years old, and got where he is by being both a loyal Nationalist cadre and a Taiwanese patriot with a sympathetic ear for the Nationalists’ pro-independence opposition.